Early writers claimed the Romans found rabbits in Spain about 200 BC and may have been the first to keep rabbits, putting them in large walled pens and letting them breed freely. They supposedly introduced rabbits to Britain when they invaded in AD 43. By the 5th century, Catholic monks in France were raising rabbits for meat. On days when Catholics were not allowed to eat meat they could eat fish, but it wasn’t always available so, in the absence of fish, Pope Gregory I officially proclaimed laurice (unborn and newborn rabbit) to be classed as fish so it could be eaten on those days. Oddly enough, the oldest sources on cookery and rearing livestock often include rabbits in the category of poultry. Tame rabbits in Britain date from roughly the 12th century and through the Middle Ages the practice spread into other parts of Europe. The Ghent Giant (later called the Flemish Giant) was a distinct breed by the 16th century. Such is the case with mine. They are a cross of a New Zealand Black and a New Zealand White and all are a lovely shade of “grey”, though the parents have produced all white, all black, or black and white mixed. Various books indicate tame rabbits should be ready to butcher at 12 weeks old provided they’ve received adequate and regular food up to that point, feeding them longer resulted in the cost of the meat per pound exceeding the value of the animal. Disease was avoided “in great measure” by keeping the cages clean and not allowing the bedding, usually hay, to become soiled and sodden in urine. Mesh on the bottom of the hutch allowed the waste to drop through into trays that could be removed and cleaned. Doing so prevented the ammonia from the urine irritating the rabbits’ eyes, and droppings soiling their fur. In-breeding generation after generation often resulted in poor quality offspring and was to be avoided; by replacing breeding does every three to four years. The breeding season lasted from February through October or into November. Giving birth was called kindling. Just before a doe was ready to kindle she prepared a nest and lined it with fur she pulled out of her own coat. The same writer claimed that once the young were two or three weeks old the doe should be allowed access with the buck again on two consecutive days so that no time was lost in bringing on a second litter. When the young were one month of age they were taken away from the mother and housed in their own compartment. If timed right, that gave the doe time to prepare for the birth of the next litter. Ames told his readers a rabbit could breed eleven times per year producing six to eight rabbits in each litter. “Thus at the end of four years a pair of Rabbits would produce nearly a million and a half”. Writers noted does were capable of rearing young by the time they reached five to six months of age and that the gestation period for rabbits was thirty to thirty one days. Does were to be put with bucks only for mating to prevent fighting and injury. Feeding costs were controlled by growing produce on a small scale to feed them and the rabbit manure so nourished the soil that a small space yielded a maximum amount of vegetables. A writer in the late Victorian era advised that a pound of hay per week was sufficient for a doe with a couple of tablespoons of oats or barley and a little green food or a root such as a parsnip, carrot, Jerusalem artichoke, potato, or turnip. This was increased somewhat after having a litter and he advised adding a little skim milk with the dry food. He thought food like cabbage leaves that contained a great deal of moisture caused diarrhea in rabbits and advised air-drying it somewhat before offering it. Recommended dry food included hay, clover-hay, oats, barley, bran, peas and beans. He also approved of chicory in the rabbits’ diet. Ames told his readers feed could include fresh clover, corn leaves, apples, beets, and lettuce. Methods of cooking rabbit varied, some authors indicating any recipe for chicken worked equally well with rabbit. The earliest recipes refer to rabbit as coney so don’t limit yourself to too narrow a search. 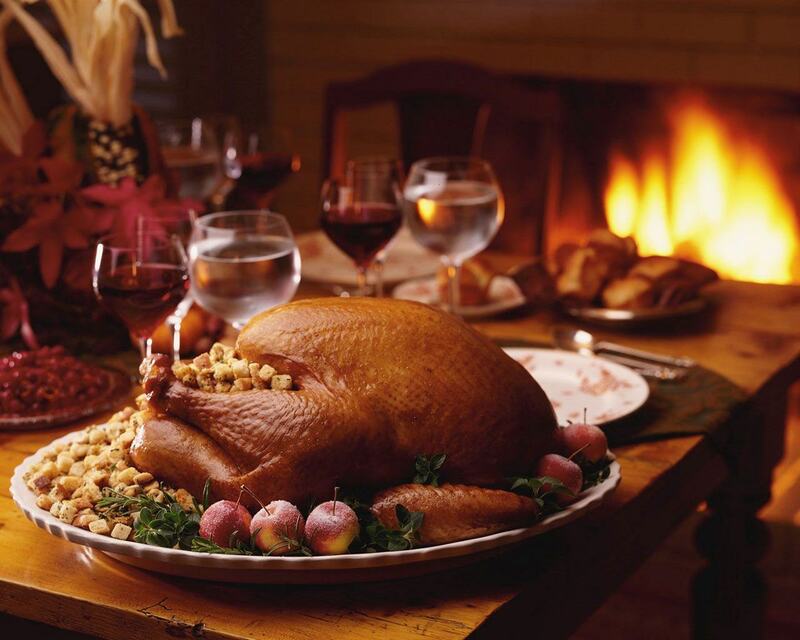 The meat was simmered and served with onion sauce, made into pies, curried, or roasted. Tame rabbits were larger than wild ones and their flesh considered delicate and nutritive, “very little inferior to chicken…”. The illustrious Hannah Glasse included in her The Art of Cookery how to roast them, how to sauce them, fricassee them, how to make Rabbit Surprise, and how to dress rabbits in casserole. Her FRICASSEE of RABBIT recipe instructed the cook to simmer the rabbits with sweet herbs and an onion until tender then remove the rabbit to a platter. To the pan juices was to be added a little butter rolled in flour to thicken the sauce and a half pint of cream and the yolk of an egg beaten well, some fresh or pickled mushrooms, and lastly the juice of half a lemon. It was necessary to stir well after adding the lemon juice so that the mixture didn’t curdle and remove it from the heat. When served, the fricassee was garnished with sliced lemon. Another version contained mace, nutmeg, and a glass of white wine. Truss them as you do a roasted hare; put them into as much boiling water as will cover them; peel a good many onions, and boil them in water whole; take some of the liquor the rabbits are boiled in, and put in a good piece of butter knead in flour; then put in the onions amongst it, keeping them breaking until the sauce be pretty thick; dish the rabbits, and pour the sauce over them all, except the heads. The same sauce serves for boiled geese or ducks. Cut your rabbits into quarters…then shake some flour over them, and fry them in lard or butter. Then put them into an earthen pipkin, with a quart of good broth, a glass of white wine, a little pepper and salt, a bunch of sweet-herbs, and a small piece of butter rolled in flour. Cover them close, and let them stew half an hour; then dish them up and pour the sauce over them. Garnish with Seville oranges cut into thin slices and notched. Half boil your rabbits, with an onion, a little whole pepper, a bunch of sweet herbs, and a piece of lemon-peel; pull the flesh into flakes, put to it a little of the liquor, a piece of butter mixed with flour, pepper, salt, nutmeg, chopped parsley, and the liver boiled and bruised; boil this up, shaking it round. “Bees, Rabbits, & Pigeons”. Ward, Lock & Co. London. 1882. Ames, D. F. “Cottage Comforts”. New York. 1838. Perkins, John. “Every Woman Her Own Housekeeper”. 1796. London. “The Universal Magazine”. Vol. 46. April 1770. “An Encyclopaedia of Domestic Economy”. 1845. Farley, John. “The London Art of Cookery and Housekeeper’s Complete Assistant”. 1785. Henderson, William Augustus, Schnebbelie, Jacob Christopher. “The Housekeeper’s Instructor”. 1823. London. Radcliffe, M. “A Modern System of Domestic Cookery”. 1823. “The Complete Farmer, Or a General Dictionary of Husbandry. 1793. “The Complete Farmer”. 1767, 1777, and 1810. Hale, Thomas. “A Compleat Body of Husbandry”. 1758. Huish, Robert. “The Female’s Friend”. 1837. McIver, Susanna. “Cookery and Pastry”. 1789. London. Frazer, Mrs. “The Practice of Cookery, Pastry, Pickling, Preserving, etc.” 1795. Glasse, Hannah. “The Art of Cookery”. 1788 and 1791. London. I love the idea of any food that is billed as coming from the wilds of North America. Pemmican was just such a survival food. “The word is from Cree pĭmĭkân, manufactured grease”, or one who makes grease. “The word is cognate with Abnaki pĕmĭkân. It was made from whatever meat was the most abundant in a particular region. In the northernmost areas reindeer was used, in milder climates buffalo was usually specified as being prevalent although deer and other animals were used. The process was pretty much the same regardless of the type of meat used. After removing fat and gristle the meat was sliced, hung to dry, perhaps smoked as it dried, and then pounded to a powder. The meat powder was mixed with fat, many accounts specify the fat came from marrow in the bones of the animal, and dried fruit was sometimes incorporated. Once well mixed the mass was packed into skin bags and the bags sewn shut. It kept several years as long as it was stored away from excess moisture. Natives also stored it away in woven baskets. An account published in 1860 stated that the pemmican was packed tightly into tin canisters leaving a little space at the top, and allowed to cool after which the tin was filled to the brim with hot melted lard. 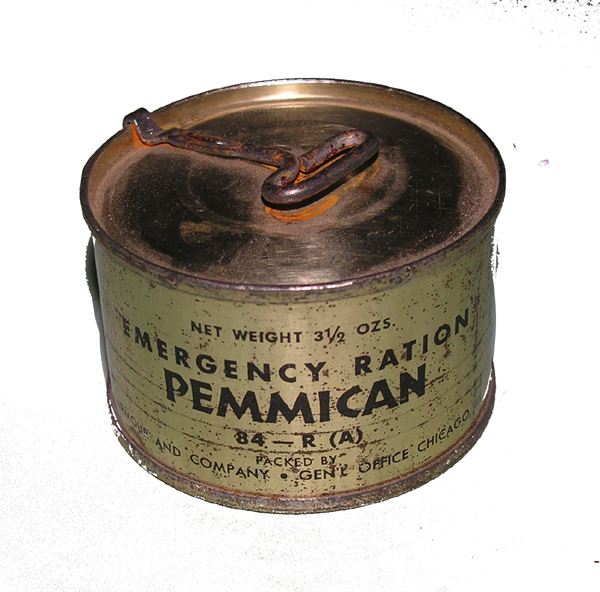 A lid was then soldered onto the canister sealing in the pemmican. – The Household Monthly. March 1860. Any berries that were available were probably added to sweeten the pemmican, but a few of the fruits I was able to document as an ingredient included June Berry (also called pemmican berry because it was frequently used in that manner), choke cherry, Saskatoon, Service berries, cranberries, Manzanita, blueberries, Juniper berries, currants, etc. Pemmican was made into soup by hunters, trappers, arctic explorers, etc. called Robbiboe, or by the Canadian French rababou. 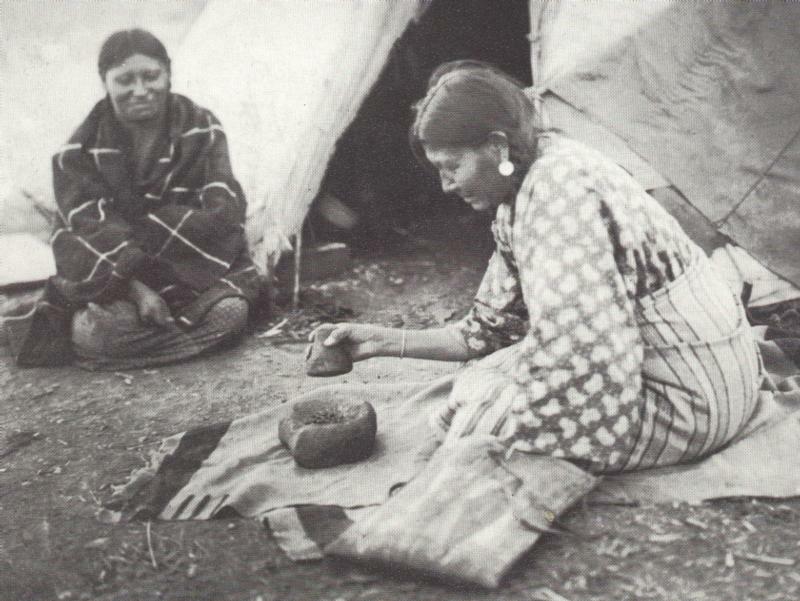 To make it the pemmican was mixed with a little flour and water and boiled. Sir Alexander Mackenzie can be consulted for an idea of the weight of the packs of pemmican. For a journey from Montreal south on the St. Lawrence River he noted the party carried four bags and a half of pemmican, weighing from eighty-five to ninety pounds each in addition to other supplies. – Mackenzie, Alexander, Sir. Voyages from Montreal, on the River St. Laurence Through the Continent of North America, to the Frozen and Pacific Oceans in the Years 1789 and 1793. 1814. New York. Robert Huish wrote of a party that carried along an amazing sixty bags each weighing ninety pounds. Gould tells us that, “one bison cow in good condition furnished dried meat and fat enough to make a bag of pemmican weighing ninety pounds”. Given that, it becomes clear how much less the meat weighed after processing having removed the bones, skin, etc. and through evaporation in the drying process. – A Narrative of the Voyages and Travels of Captain Beechey: To the Pacific and Behring’s Straits and The Travels of Capt. Back, R. N. to the Great Fish River and Arctic Seas. 1836. London. Gould, Augustus Addison. The Naturalist’s Library: Containing Scientific and Popular Descriptions of Natural History. 1833. Massachusetts. Hamilton reckoned one pound of pemmican was equal to five pounds of meat. – Hamilton, William. My Sixty Years on the Plains. 1905. NY. For those who prefer more of an actual recipe than a method summary, Mrs. Saray Tyson Rorer offered one, although it varied in method. ¼ pound of lean beef put twice through a meat chopper, ¼ pound of marrow from the leg or shin bone of an ox. Chop the marrow with a silver knife and remove the fibre. Mix the beef and marrow thoroughly, a half saltspoonful of salt and stand at once in a cold place. – Mrs. Rorer’s Diet for the Sick. 1914. See: Hodge, Frederick Webb. Handbook of American Indians North of Mexico. Washington Government Printing Office. 1912. The idea for today’s post came from the book, “Cracker Culture: Celtic Ways in the Old South”, by Grady McWhiney. In the chapter on herding, he discusses driving free-range hogs to market saying, “Throughout the antebellum period Southerners drove enormous herds of livestock over long distances to market. Thousands of swine went east, north, and south each year along established routes.” He went on to share numbers showing more hogs were herded between 1866 and 1880 than cattle. In 1820, Winchester, Virginia passed an act to the effect that citizens within the town could not keep hogs and let them go at will because doing so tended to spoil the water for human consumption. The act, however, did not limit a non-resident from driving his hogs through the town in order to get them to market, to butcher them, or to drive them from one plantation to another. – March 1st, 1761. Just what was it like herding hogs? “The hog is one of the most difficult and unsatisfactory animals to drive and particularly so if an effort is made to force the animal or animals in question. On the other hand, hogs are very easy animals to lead if they are trained to it, and the best way to train them is to get them in the habit of following a man with some feed, which feed they get after they have followed him a certain distance.” This is an excellent example of how a thing was not hard to accomplish when one knew how, but in later years when the knowledge was lost tended to seem very difficult. How many head could be driven at a time? For the answer to that we look at an account from an old retired farmer in Missouri. He noted seeing 2,000 hogs pass through Columbia on the way to St. Louis. They were divided into, “lots of convenient size. The drovers had long whips which they cracked as they went along”. Cracking the whips was accepted, but striking the hogs with the whip was not as it bruised the meat. The gentleman claimed that ten miles per day was about the most that could be covered and except for the man in charge the drovers walked along with the herd. The man on horseback was responsible for riding ahead to procure corn to feed the hogs when stopped for the night. Indeed, farmers often profited from the sale of corn to the hog drovers along established routes. Some farmers planted large fields of corn for this purpose and rode several miles out to meet with the drovers to negotiate the price of said corn. “It is said that the soil of Teay’s valley [W. VA] was worn out by continued cultivation of corn to supply the demand of hog traffic”. “It was generally the depth of winter during the hog-driving season”, and the drovers found lodgings at a tavern or a farmhouse, most having a room set aside for the use of such persons. When the rivers were frozen hard enough the hogs were marched across at other times they were ferried across. “The present generation is little aware of the long distances which hogs used to travel during the thirties and forties of last century [1830-40]”, up to the use of the railroads. The railroads eliminated the need to drive large herds but did not bring about an instant end to hog driving because small farmers who could not afford to ship by rail had no choice but to continue to drive their hogs to market. The books of a Kentucky man were examined and quoted in a book published in 1838 showing the number of animals that had passed his door headed South in 1835. There were 4,716 horses, 1,951 mules, 2,485 beeves, 2,887 shoats, 1,320 sheep, and 69,187 hogs. As one would expect, the extreme heat and humidity of July and August was noted to make the process more difficult and sometimes the condition of hogs that had been herded some distance at that time of year suffered. A Cincinnati paper contained an article on pork coming in for slaughter saying that farmers sometimes banded together, each having his own hogs intermingled in the numbers being driven to market, while others chose to sell their hogs to drovers who resold them upon reaching Cincinnati. The greatest danger in combining animals in this way was the spread of disease from sick animals. Who was doing the driving? In short, just about anybody. Numerous sources depict boys and men of various stations taking the job of driving hogs in order to make wages. Horace Greely noted women doing hard work around farms including driving hogs to and from market. Even the military got into the act of driving hogs as evidenced by a letter from G. W. Randolph, Secretary of War, to General Marshall asking if his cavalry could be employed in driving hogs out of eastern Kentucky [Nov. 12, 1862). Guilford, William Sumner. “California Hog Book”. 1915. San Francisco. “Transactions of the Illinois State Agricultural Society”. 1870. Springfield. Henning, William Waller. “The Statutes at Large”. 1820. Richmond. Missouri Dept. of Agriculture. “Bulletin”. Vol. 20. Nov. 1920. U.S. War Dept. “The War of the Rebellion”. “The Cultivator”. May 1843. Albany, NY. West Virginia Geological and Economic Survey”. “Fayette County”. Vol. 2. 1919. “The Wool Grower and Magazine of Agriculture and Horticulture”. August 1851.